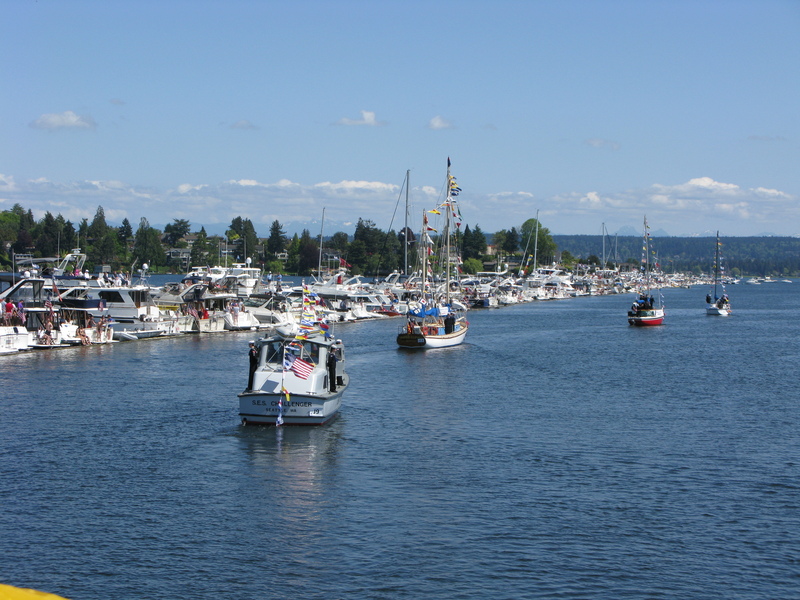 Opening Day of the boating season is something that Seattle has been doing for more than a century. 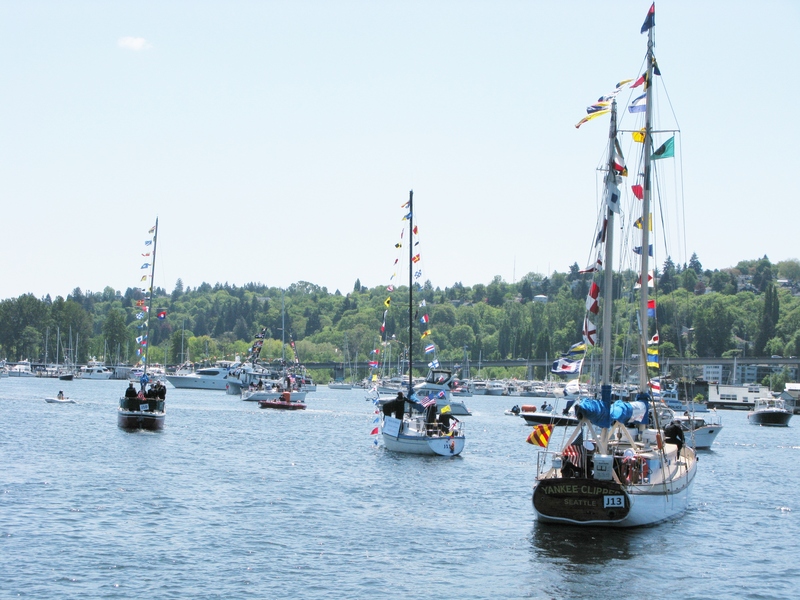 And the Sea Scout Ship Yankee Clipper has been there for a good portion of the opening days since the Seattle Yacht Club first started parading through the cut at Montlake in 1920. Our Chartered Organization Rep and Skipper Emeritus John Kelly says his first Opening Day was 1937 when he took a varnished International 14 down the parade route. And attention Adam K; John won the race that followed. So, you’ve got some big shoes to fill on the racing circuit. Opening Day in Seattle can be cold, windy, rainy….and a bit of a confusing mess. Saturday, May 2, was none of those things. It was, in a word, awesome. It was sunny and clear, with a light westerly breeze and a temperature of 65-degrees. Warm enough to be comfortable, but not so hot as to make the uniform of the day, all wool dress blues, unbearable. So, what does that mean anyway, “Dress Ship?” Well, when you’re going to do a public event you want to make sure your ship is clean, tidy, and looks great. What do they call that? Oh right. Ship Shape! An adjective meaning “properly arranged”. In addition to that, to Dress Ship specifically means, decorate a ship with flags. And when the Seattle Yacht Club organizes the parade they send out a notice of what the recommended order of flags is. You start with the first flag at the waterline off your bow, bring the line of flags up over the boat, and end at the waterline off the stern. 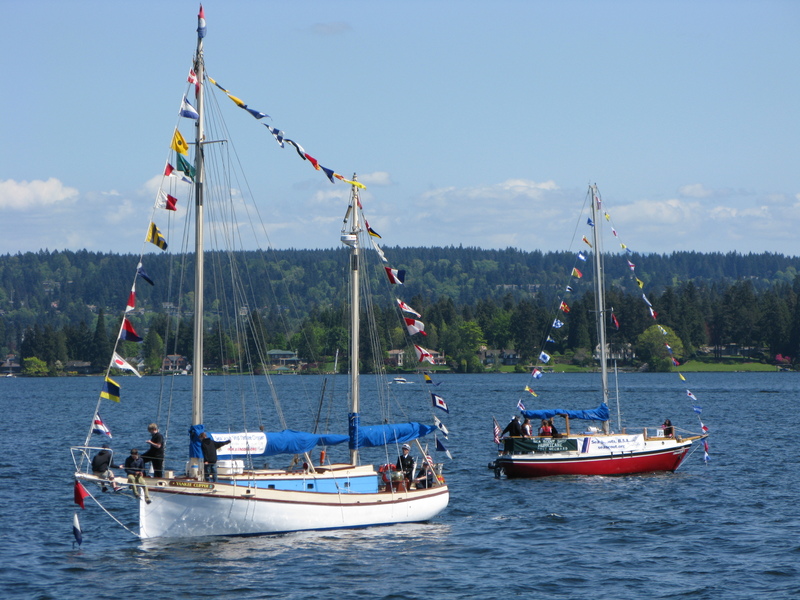 This year the SSS Yankee Clipper came over from Ballard, the SSS Argo came across from Bellevue, the SSS Hurricane came in from Port Orchard across Puget Sound, and the SSS Kelcema from the Mount Baker Council to the North came by land, and used one of the Fleet Sailing Program Boats as their stand in vessel. 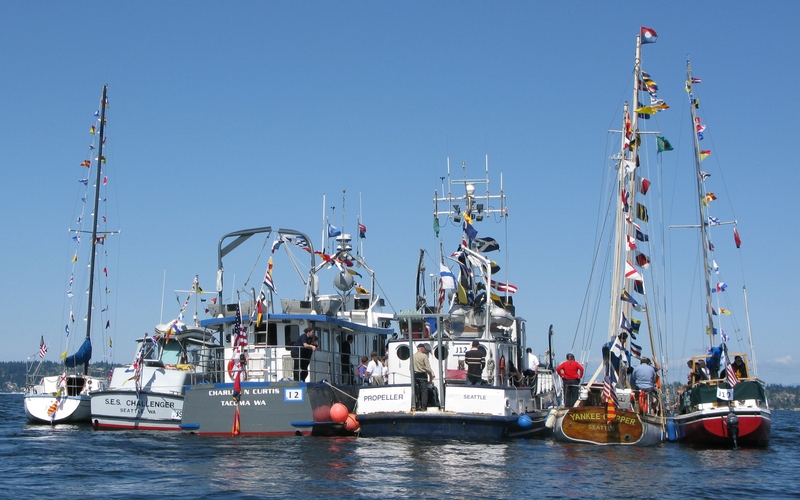 In all 5 boat would join the boat parade and compete as a fleet in the Wilson Seamanship Trophy. Now we never expect to win this class as the Yacht Clubs compete hard in the class with intricate maneuvers in 5 matched small boats. 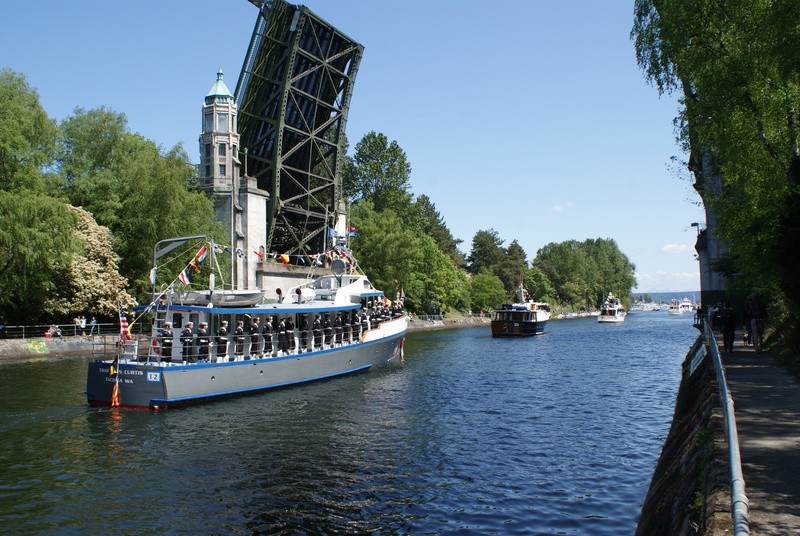 Our fleet’s mix of large and small sail and power boats, with different speeds and turning ranges, makes it difficult to maneuver in the tight confines of the Montlake Cut. 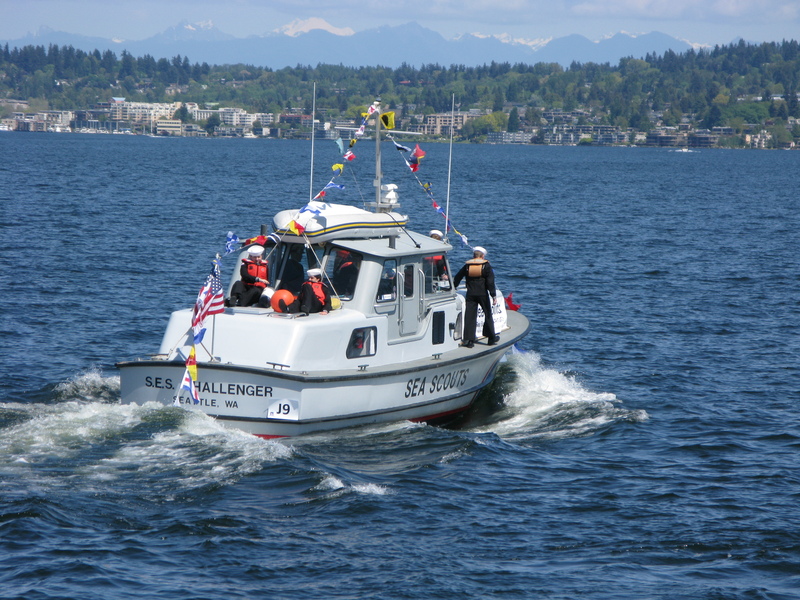 But competing in the Wilson Class allows the Sea Scouts to pass in review as a fleet, and we think that’s much more important to raise the profile of Sea Scouting in Seattle. This year the Kelcema led the fleet down the left side of the cut. Some of the thousands of people lining the shore may have wondered why we were over on the left, as the judges barge was to the right side. The answer came when the SSS Propeller in the rear of the fleet sounded her huge horn, vibrating off the sides of the concrete canyon below the Montlake Bridge. At the sound of the horn the entire Seattle Sea Scout Fleet executed a Right Echelon maneuver, bringing the line of ships as one over to the judges. The first boat, the SSS Kelcema, fired a cannon salute and as each ship passed the officers and judges barges the Sea Scouts lining the rails executed a crisp salute. Winning the Wilson Trophy was never really a question. Congratulations to the Royal Victoria YC from Canada for taking top honors this year. 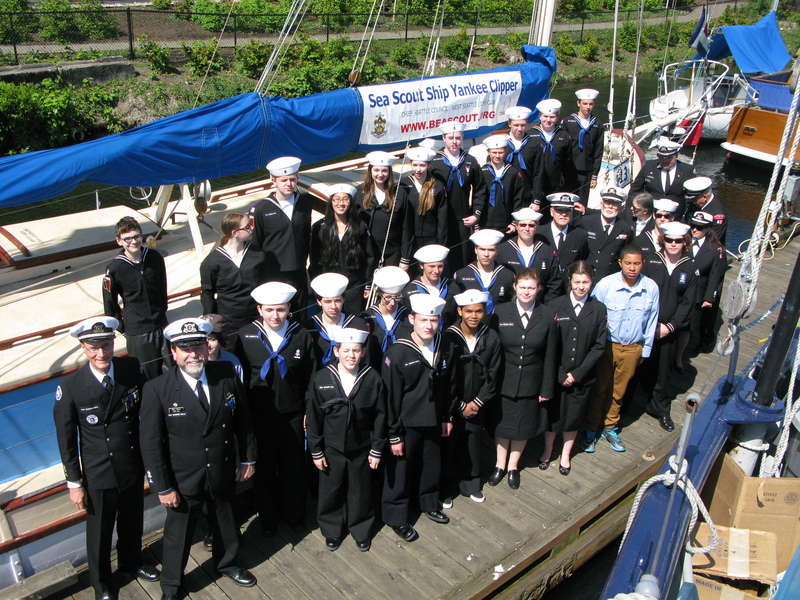 But when you hear the applause from both sides of the cut and calls of “Well Done”, and “Go Sea Scouts” from the uniformed officers of the Seattle Yacht Club…you know you’ve done what you intended to do….make sure they know we’re still here, still serving the youth of Seattle who want to know about things maritime. After that, another horn signal from the SSS Propeller brought another fleet maneuver back to center of the parade route and the long run down the log boom lined with hundreds of boats and spectators who shouted and cheered and wanted nothing more than a boom from the Sea Scouts cannon or blast from the massive horn on the Propeller. Happy to oblige. 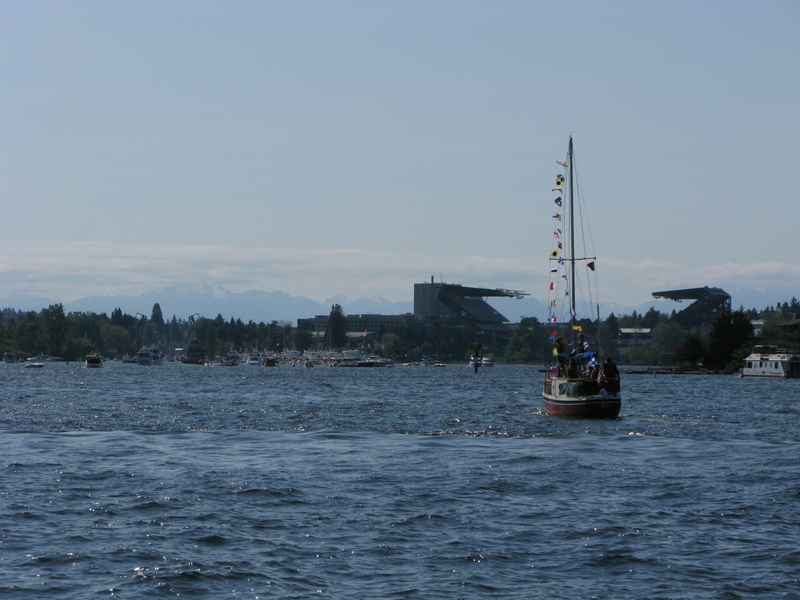 Now one thing about a boat parade through Seattle’s Montlake Cut is that once through, you aren’t going back for a while. The parade take from noon until 3:30pm. 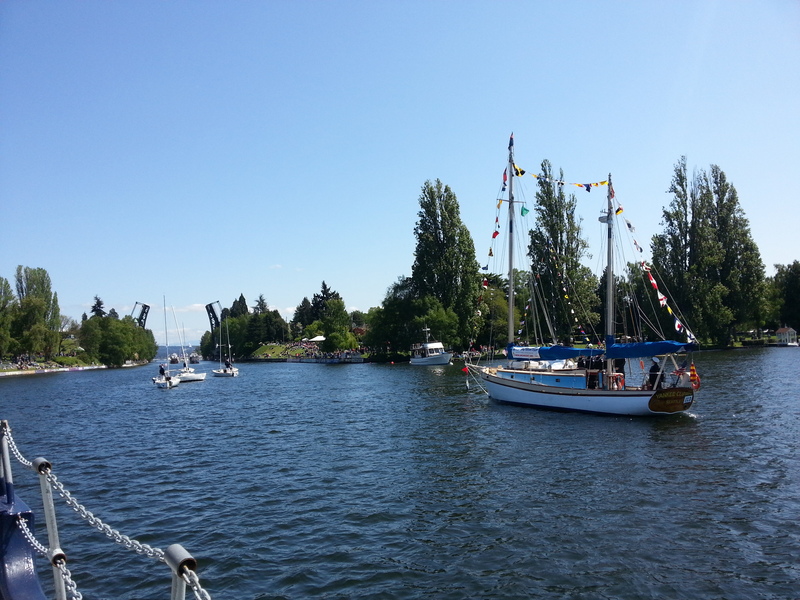 So the ships of the Seattle Sea Scout Fleet always plan a BBQ out in the middle of Lake Washington where we just raft up, and float with the wind while we fire up hot dogs, chips cookies and drinks for all aboard. This year the Sea Scout Ship Charles N. Curtis from Tacoma joined the raft up. 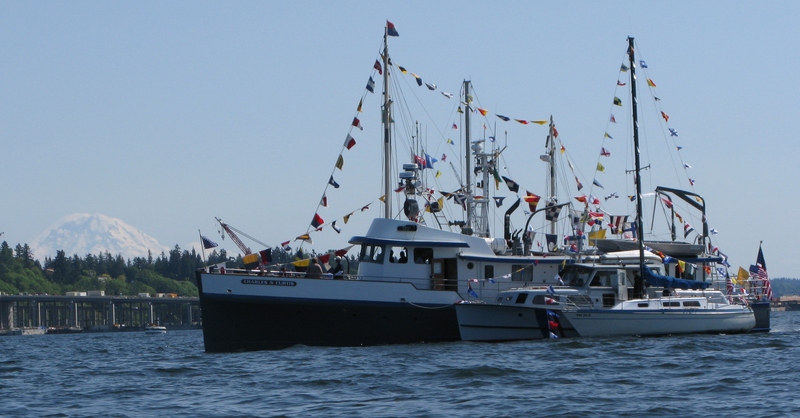 The Curtis and her sister ship the SSS Odyssey come to the Seattle Opening Day on alternate years. They traditionally compete in the solo classes, and this year the Curtis won her division for dressed power vessel. With about two dozen Sea Scouts lining the rails, who could possibly beat them for best power boat. The six Sea Scout boats all maneuvered expertly into position, exchanged lines and springs, and created their own floating village. Once the boat were secure it was time to cook and eat, and tour everyone else’s boats. After about an hour and a half, there was a horn, then the call….”Return to your ships” on the loud hailer. The time had come to man the lines and carefully release each vessel to her own control. The “Cut” was open the other way, and it was time to head back through and head for our home docks. Thanks to all the fleet Skippers for once again making sure we all got through the event and home to the docks safe and sound. Now, on to Spring and Summer cruises! 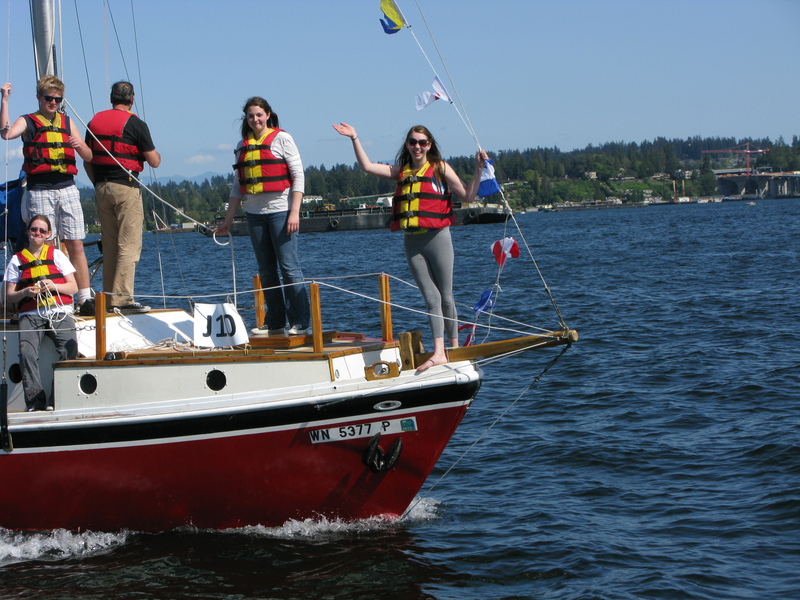 If you know any young men and women who are completing the 8th grade or are 14 who might like to know a little more about Sea Scouting, have them check out the Chief Seattle Council’s Sea Scout Fleet web site. Awesome day on the water in Seattle! Job well done. While my old Sea Scout Ship is gone, it’s good to see the Seattle Area Council still doing well. And look closely to spot the T-Boat. I have fond memories of a really cute girl from the SSS Propeller when we were rafted together off Stuart Island.